Amritsar: With Indo-Pak relations on a low after the Mumbai terror attacks, construction of a corridor between Dera Baba Nanak (India) and Gurdwara Kartarpur Sahib (Pakistan), where Guru Nanak Dev had spent more than 17 years, could get delayed. 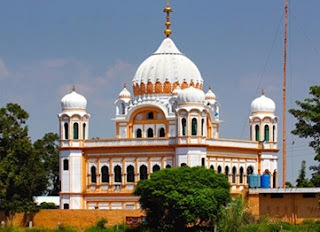 Kartarpur is 2 km from the international border on the banks of Ravi. This is what BS Goraya of Sangat Langha Kartarpur believes when asked about the progress on the project. “We have waited for a long time and will continue to do so,” he said. Sounding a positive note, Goraya, who has been agitating for the corridor through his organization, said the terror incidents wouldn’t derail the peace process between the two nations. 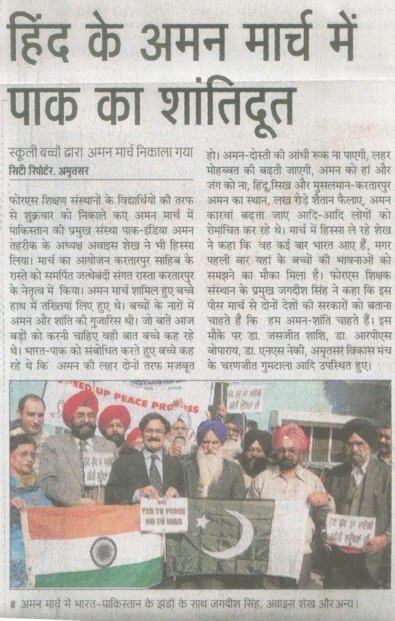 Members of Sangat Langha Kartarpur, India-Pakistan Peace Initiative’s ambassador Awais Sheikh, director of SSSS School Jagdish Singh and students took out a peace march in Amritsar in support of the corridor and peace initiatives between the two countries. Sheikh said he would also take up the issue of the passage through his organization in Pakistan. He added Pakistanis were equally hurt following the Mumbai attacks. “After the gruesome attacks, we took out a peace march in Lahore with the visiting executive director of Association of Communal Harmony in Asia Preetam Rohila and his wife Kundan. So, you can understand our feelings,” he added. Jagdish said, “The recent terror incident would certainly delay the process,” and added he was hopeful that the day was not far when people would be able to walk to Kartarpur Sahib. People of Pakistan also felt the pain as the Indian people have as more than 200 innocent lives were lost besides several hundred injured in the terror attacks in Mumbai. Stating this to mediapersons here today, Awais Sheikh, president, Pak-India Peace Initiative (PIPI), said Pakistan was also passing through the same phase as hundreds of people were being killed in terrorist violence there. He said he had come to India on the auspicious day of Id-ul-Zuha to show solidarity with the kin of those killed in the carnage. 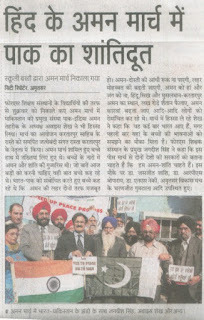 Shiekh was in the city to participate in the peace march organised by students and staff of Sant Singh Sukha Singh Senior Secondary School to show solidarity with the kin of those killed in Mumbai attacks. The students holding placards and banners raised slogans against terrorism and urged India and Pakistan to jointly launch operation against the terrorists to bring peace in the subcontinent. Speaking on the occasion, Jagdish Singh, director of the school, pitched for the opening of Kartarpur corridor so that the Sikh community on this side of the border could visit the gurdwara on the Pakistan side, which was also the birth place of the first Sikh Guru, Guru Nanak Dev. Organised by Sangat Langha Kartarpur, the students of 4S Group of Institutions Amritsar took out a peace march in Amritsar. It was led by Mr. Awais Sheikh of Lahore Pakistan and S. Jagdish Singh Director of 4S institutions. The theme of peace march was that the Govt of India and Pakistan should speed up the ongoing peace process. Many respected personalities of Amritsar participated in it. The following is press note which was issued by Sangat.